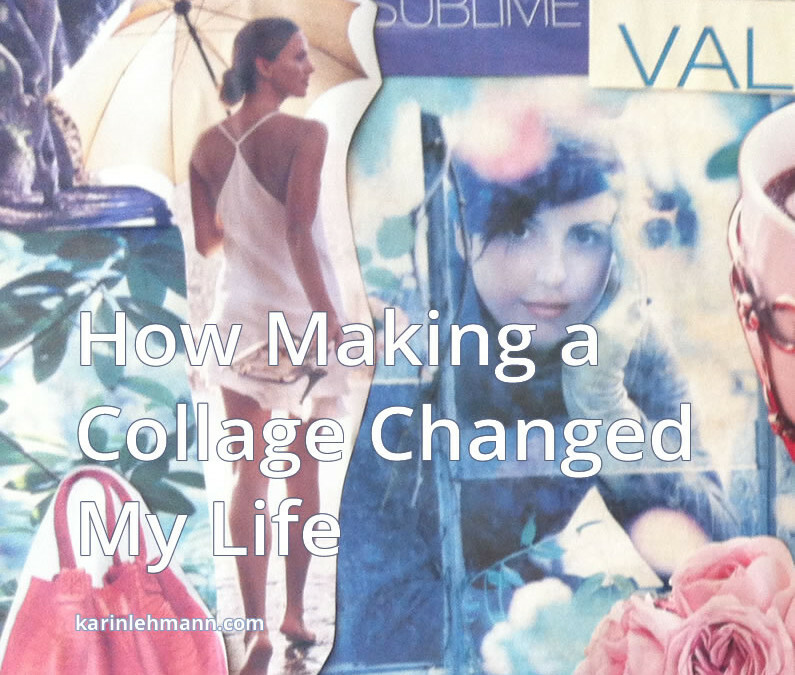 Find out how making a collage changed my life – and how it can change yours. I love making collages and over the years creating them has turned into a ritual I cherish. 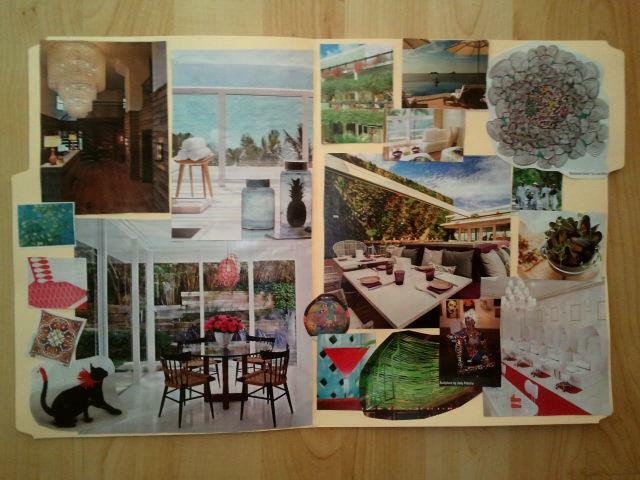 When crafting one I go with the flow, selecting pictures that inspire me and make me happy. Not knowing in advance what will emerge makes the experience exciting and mysterious. It all started many years ago when one of my friends invited me to a collage evening. “You’ll have a good time,” she promised, “Making a collage is very powerful. You can conjure up miracles through the process.” Really? I was hooked. The evening turned out to be a lot of fun. We were a group of women, sifting through old magazines, having great conversations, and letting our imagination flow. To my surprise, my collage turned out very romantic with lots of flowers, lace, and pictures of loving couples. I didn’t know what to make of it. I was a single mom in Manhattan, busy making a living and taking care of my three kids. Romance was not on my list of priorities. Nevertheless, I loved my creation and hung it on my bedroom wall in a nice golden frame. A few weeks later, one of my colleagues and good friends came to visit from Germany. She took a long look at my collage and said “There is this fabulous man in Berlin you should meet. I think you’ll like him.” Wow. I was stunned – and intrigued. She noticed my confusion and told me that by looking at the collage she had felt my desire for a good man and that he happened to come to mind. Well, to make a long story short, today I am married to Mr. Fabulous and he has changed my life in many amazing ways. There is something very powerful about images. They conjure up possibilities, inspire imagination, and call forward hidden desires. If you are at the crossroads in your own life trying to get clear on what path to take – or, if you want to activate your imagination and explore your hidden desires, I highly recommend you take some time, a few old magazines, and craft a collage. Make it as big or as small as you like. Use a sketch pad and fill it with page after page of wonderful images of how you envision your future or use a big poster board that you can hang up on your wall once finished. Have fun with the process. If you like, send me a picture of your finished creation. I’d be happy to post it here and enhance its magic conjuring powers. 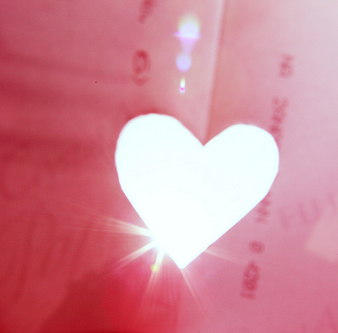 With love and as always, thank you for reading. Digging this story? Sign up for updates … it’s free! 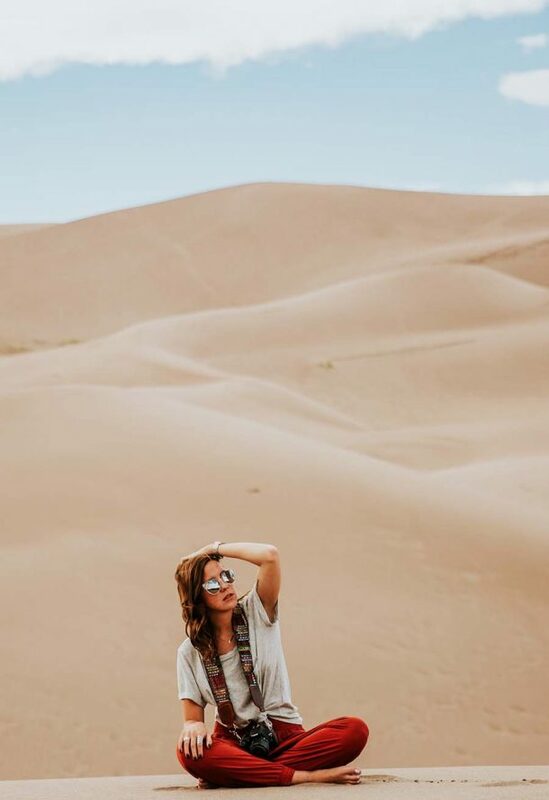 And, if you want to discover your special qualities, consider participating in a one-on-one session – for women who want to find their gift, fall in love with themselves and change the world. 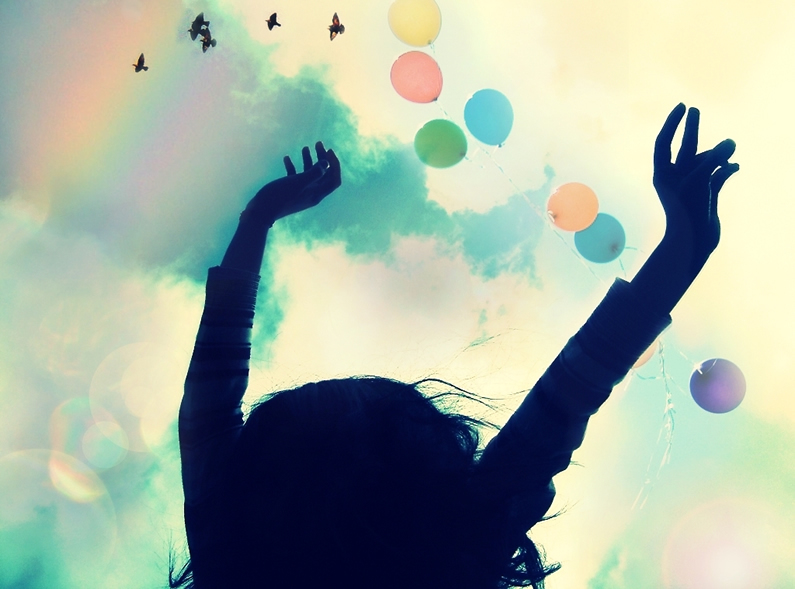 FANCY A WEEKLY ENERGY LIFT? Success! You are now signed up for Karin's Newsletter. 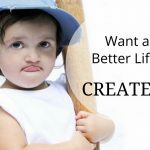 Want a Better Life? Create It. Lovely post, Karin! 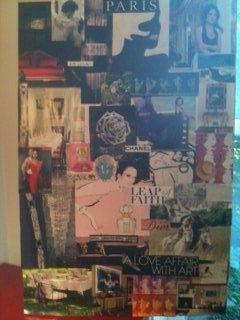 I can definitely see the therapeutic potential of collage making. Thank you, August! It inspired my daughter to make one with all animals on it, very cute and clear message of her desire for a pet. Thank you Karin. 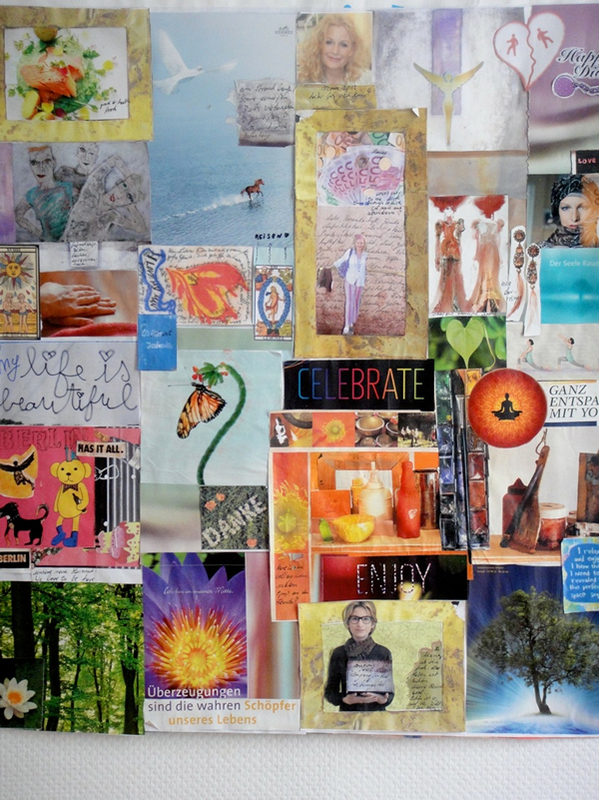 You shared beautifully about the value and fun of collaging! I’ve done a lot of collages and yet not lately . . . so thanks for reminding me and inspiring me to continue collaging! Hi Donna, so glad to inspire! Please, feel free to send a picture of what you are creating. I’ll post the collages here. Katrina Morris made this wonderful collage. A collage evening! What an awesome idea! Will definitely do that once we are settled again. Thanks for sharing! Franzi, when are you back in Berlin? I will be there in July and would love to see you. MOST PEOPLE NEVER FIND THEIR TRUE CALLING! 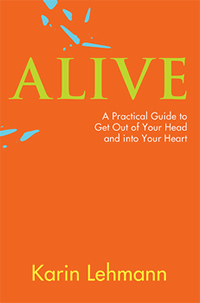 Discover the FOUR MISTAKES that keep you from uncovering your purpose! Plus, learn ONE SIMPLE STEP to FIND YOUR GIFT once and for all!